With pages 30% larger than the regular edition�s, and weighing in at 1,504 pages (more than three times the page count), the new Deluxe Edition MEGA RED includes more valuable information about your coins. The fifth Deluxe Edition MEGA RED is the latest expanded version of the hobby�s best-selling �Red Book� (more than 24 million copies sold since 1946). 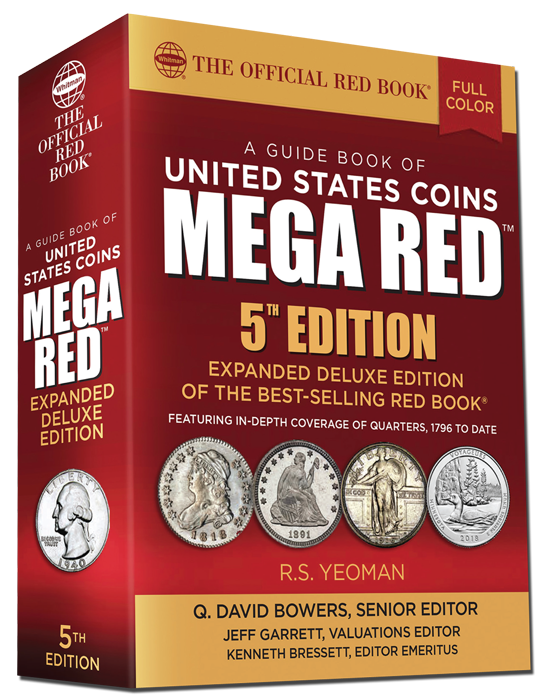 With pages 30% larger than the regular edition�s, and weighing in at 1,504 pages (more than three times the page count), the new Deluxe Edition MEGA RED includes more historical information, extensive grading instructions with enlarged illustrations, a special hundreds-of-pages in-depth feature on Shield, Liberty Head, Buffalo, and Jefferson nickels, and valuable essays on collecting and investing in rare coins. MEGA RED has certified population data, more die varieties, more auction records, and more pricing in more grades than the regular-edition Red Book. It covers American coinage from colonial times to the modern day�half cents through $20 gold double eagles, plus bullion, commemoratives, Proof and Mint sets, significant tokens, errors, and other collectibles. MEGA RED prices more than 8,200 items in up to 13 grades each, with 47,000 individual values, 15,800 auction records, and 6,000 images (thousands of which are updated or new to the third edition). xpanded sections and new features in the third edition include: an overview price-guide of foreign coins that circulated as cash in the British American colonies; a new illustrated history and price guide of So-Called Dollars; insight on counterfeit and spurious coins; advice on collecting and investing in modern gold and silver bullion coins; an illustrated history of the nickel five-cent piece; and more.